The implementation of expanded replay has come under a fair amount of fire this year. We've all seen a scenario like this: after the obligatory dawdle while his video guy looks at the play, the manager challenges a ruling on the field, and we all watch a number of angles at home while the umpire at MLBAM makes his decision. The replays seem to clearly show that the call was incorrect...but, after a minute or two of a wait, the call in the field is upheld. The reason? No clear and indisputable evidence that the call was wrong, despite it being pretty clear that it actually is. This scenario has both hurt and helped the Reds this year, but either way it is maddening to watch. Replay is supposed to help get calls right. If it's upholding the wrong call, then what is the point of going through this? That'st the 233rd play that's been overturned in barely more than two months. (http://t.co/Yo6oTnxPhJ) Yeah, I'd say replay is a good idea. I thought it was a really good point. Replay isn't perfect. But with every overturned call, we're seeing mistakes being fixed that otherwise would have been upheld. Umpires still blow calls, and replay still fails to correct some of them. But we've already seen hundreds of incorrect calls fixed this season. Hundreds! The blue line is a cumulative average for the entire season. What we can see is that the rate of calls being overturned started at or around 40% in April, but then rose steadily through May and has flat-lined around the current 47%. 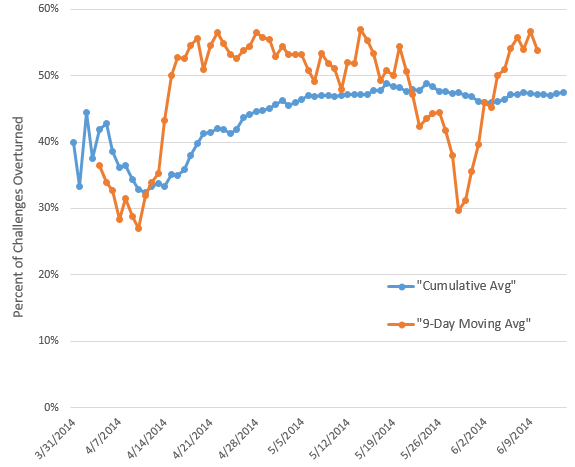 The 9-day moving average is a bit more revealing. It seems as though the replay umpires began the season being pretty conservative for the first two weeks. Then, they started to routinely overturn just over half of the calls from that point on...with a strange dip that occurred at the end of May/beginning of June (~23 May through 3 June). I don't know what happened during that dip, but the rate of overturned calls dropped down to 30% for a brief period. I'm going to speculate that the umpires are still making adjustments to their internal criteria for when to overturn calls. Therefore, we might have seen a short-term adjustment to be more conservative, which was then quickly relaxed. So, if the MLB average is that just shy of half of all challenges are successful in getting a call overturned, why does it seem like the Reds almost always lose their challenges? Probably, it's because the Reds have almost always lost their challenges. The Reds are tied for the fewest challenges in all of baseball with 9 (the highest are the Cubs & Rays with 23 each). They have won just 2 of their challenges (22%). In contrast, the teams the Reds have played have made 14 challenges against the Reds, and have won 8 of them (57%). Replay has not been kind to the Reds thus far. Who is to blame? The Reds' video guy? Small sample sizes? Bad luck? I'd lean toward the latter explanations. But...yeesh, let's hope their luck changes soon.